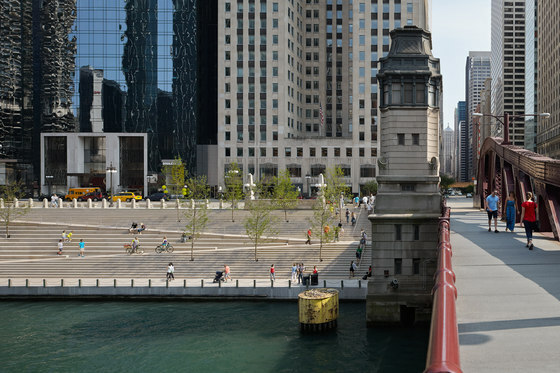 Utilizing derelict infrastructure, the Chicago Riverwalk is a one-and-a-half-mile-long civic space between Lake Michigan and the confluence of the main, north, and south branches of the Chicago River. 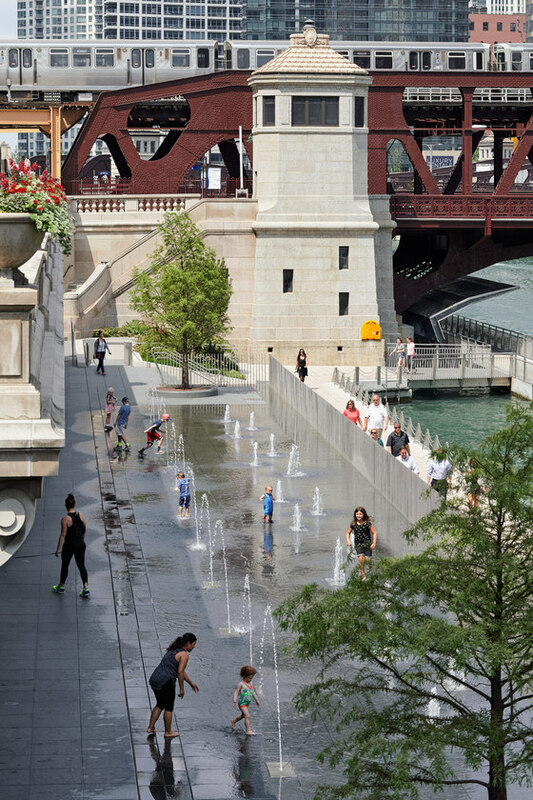 This reinvention of urban life is at the heart of a new chapter for Chicago in which public space becomes a gathering ground for citizens from all walks of life. 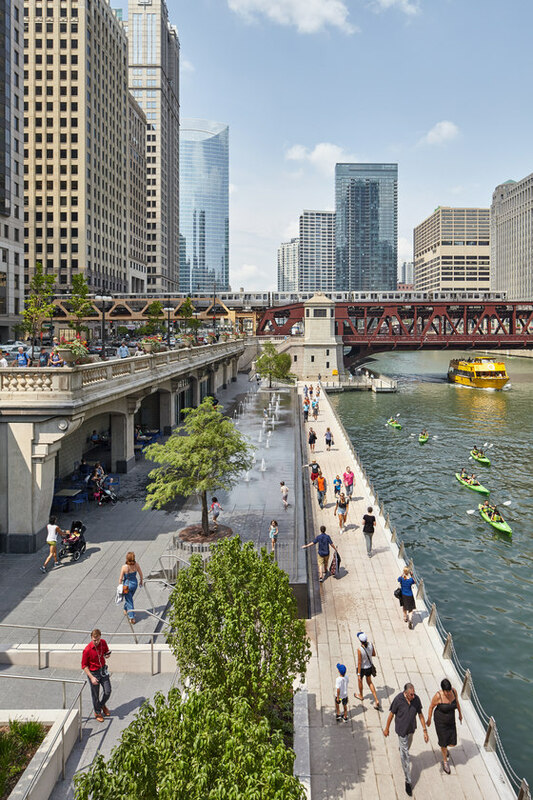 With sweeping views and new connectivity, this invaluable civic amenity returns the River to Chicago and Chicago to the River. 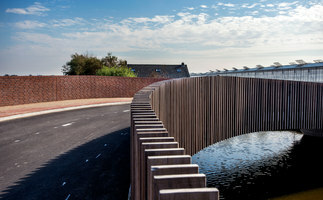 Conceptually, the park references the infrastructure that defines it by creating unique rooms between the bridges that cross the river. 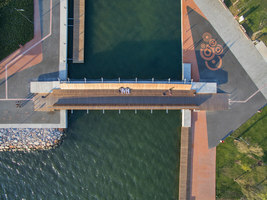 These new connections enrich and diversify life along the water with each block taking on a unique character and typology, from hardscaped civic space to naturally planted shoreline. 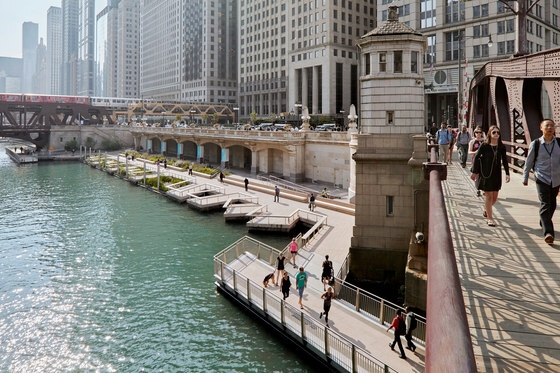 There were many challenges in realizing the vision for the Riverwalk, both subtile and overt. 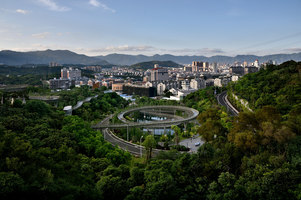 Providing connectivity from room to room, without having to go 22 feet up to street level and back down again, was identified as one of the key features needed to make the project successful. 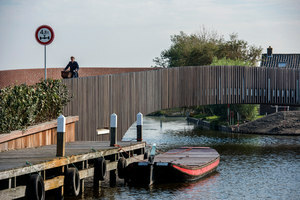 In order to accomplish this task, the team and the City needed a congressional act passed to allow for the alteration of an existing dock wall. Respecting the still active shipping channel allowed for specific build out areas from 20 - 25 feet in a typical block and nearly 50 feet at the confluence. 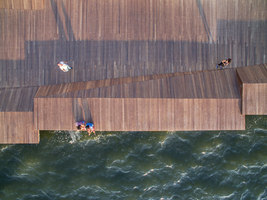 Existing conditions included a shallow arcade that would later become leasable storefront and a dockwall that was separated from the river by 5 feet, distancing pedestrians from feeling a connection with the water. 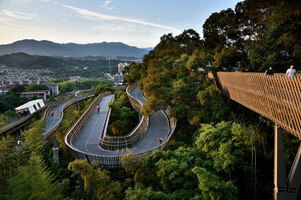 To stitch the series of rooms together with a continuous path, underbridge connections were designed. These connections needed to be completely separate and independent from the existing structure. 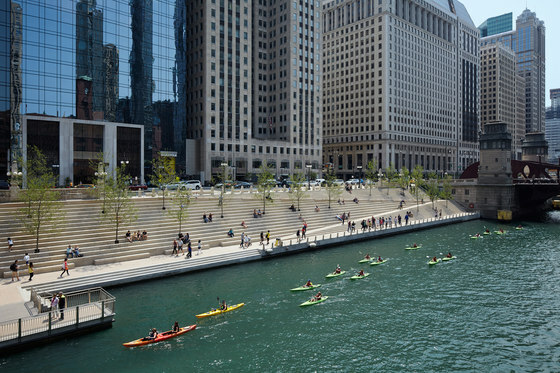 Separated from street level by 22 feet, the Chicago Riverwalk provided a unique elevation challenge. 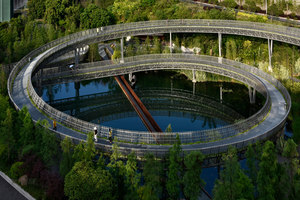 Additionally, the park had to be resilient enough to withstand yearly floods due to heavy rainfall and a 100 year storm. 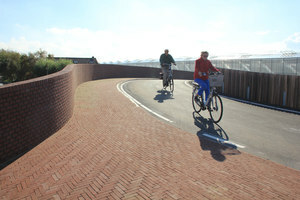 The design was put to the test in June 2015. Within 24 hours, the hardscape had been power washed and was open to the public. A series of unusual construction challenges resulted from the creation of new land, including the limited space in which to work. 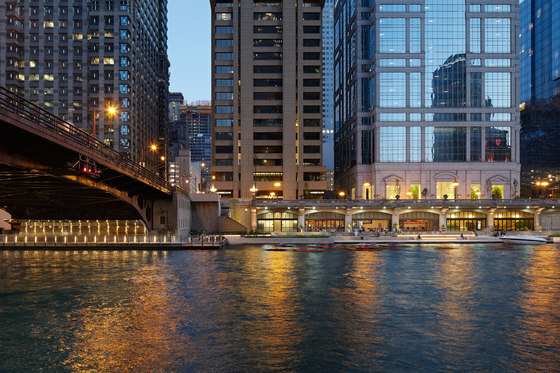 With Lower Wacker Drive active, construction staging took place on adjacent barges, which pulled up to active areas with materials and equipment. Constructing a new dock wall came with its own series of complexities, including the need for a team of underwater divers. Interruption of street traffic was occasionally necessary to lift the bridges for work on connections underneath. 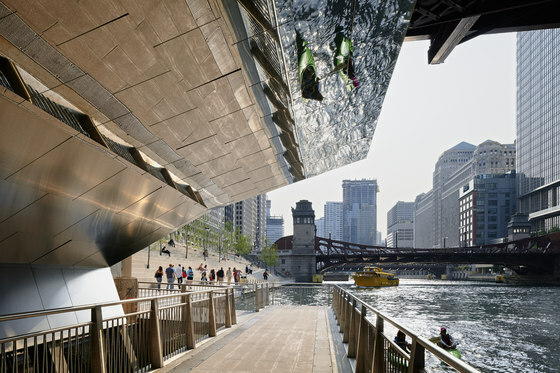 Concluding in 2009, the first phase of the Chicago Riverwalk was comprised of a plaza commemorating Chicago’s Vietnam Veterans and a connected path from Michigan Avenue to State Street. 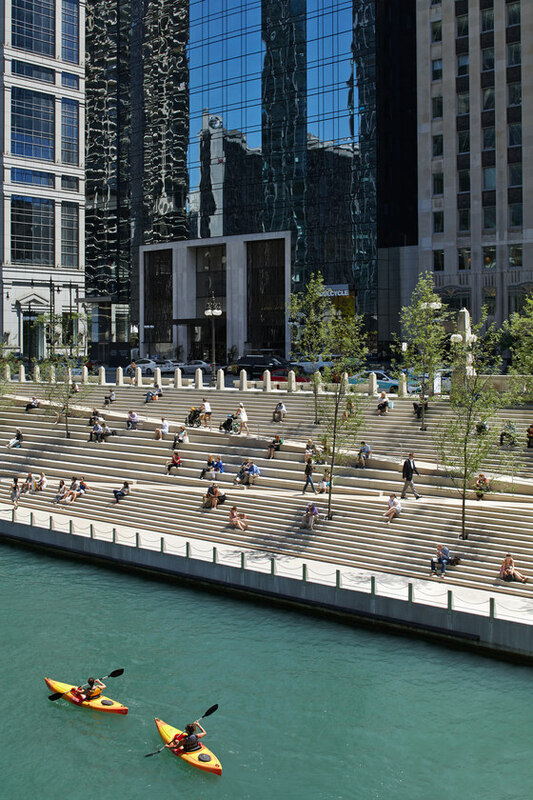 Designed with terraces and bench-lined ramps, the plaza provides a moment of respite from the city street. An integrated memorial, one of the largest outside of Washington D.C. dedicated to the Vietnam War, provides space for reflection and education. A wall with names of those fallen is listed chronologically in references to key events that are etched on the pavement, connecting the gravity and tension of the war. 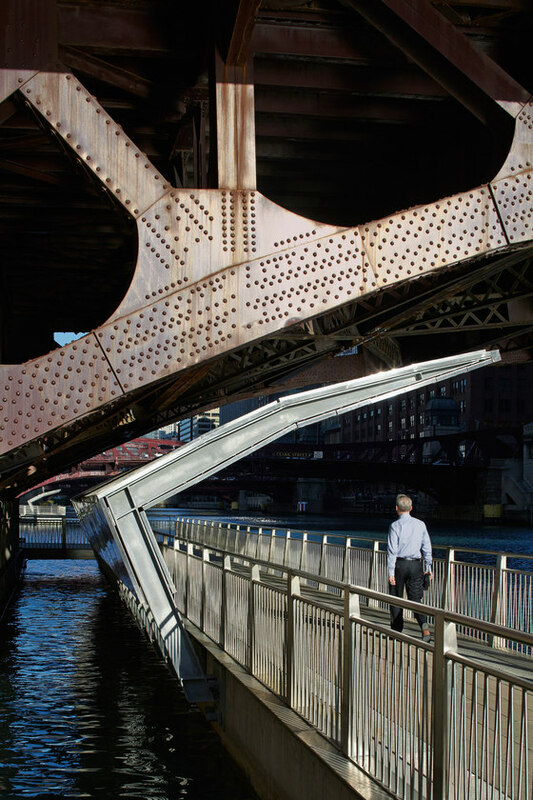 Crucial to the success of the park is a continuous path at river level that brings pedestrians underneath Chicago’s iconic bascule bridges. 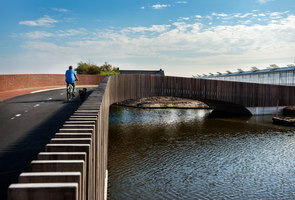 A protective canopy was designed to shield the path from the open roadway above while reflecting the adjacent water, enveloping the space with light and movement. 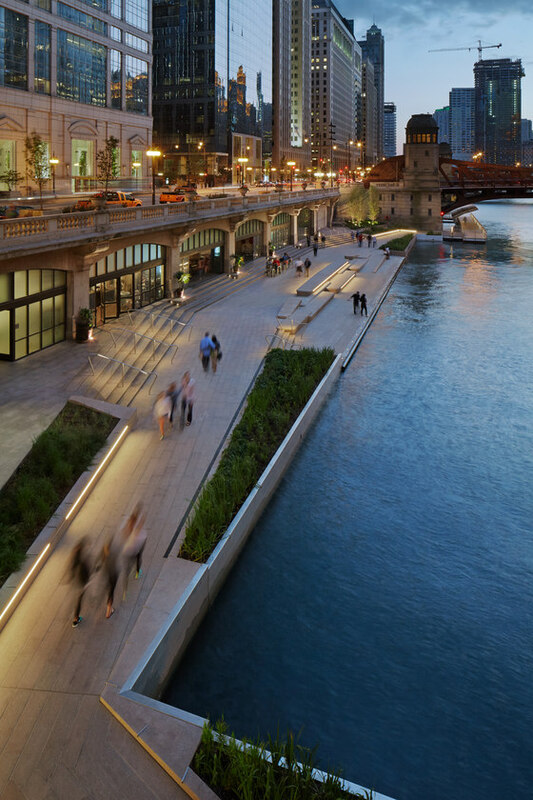 Completed in 2015, the second phase of the Chicago Riverwalk brings pedestrians closer to the water while removing railings where possible. 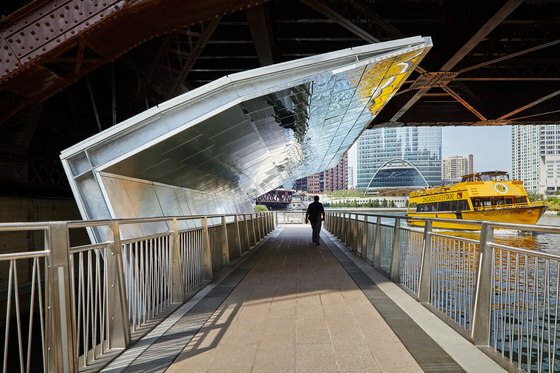 This design re-invents the relationship Chicagoan’s and urban residents have with a natural resources that has long had a bad reputation due to past industrial uses. 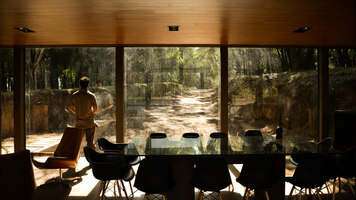 With increased recreation in mind, two rooms were designed for motor and human powered water crafts. 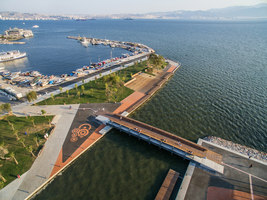 The Marina provides a safe harbor for small vessels and a boat docking service that allows patrons to arrive by foot, rail, bus, bike, and water. 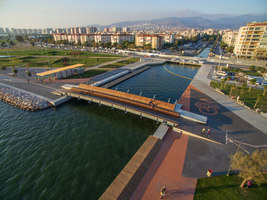 The Cove, as the name suggests, embraces increased water recreation on the River. With a freeboard edge that allows kayakers to disembark and pull their canoe onshore. A link to the streets above is provided at the River Theater. 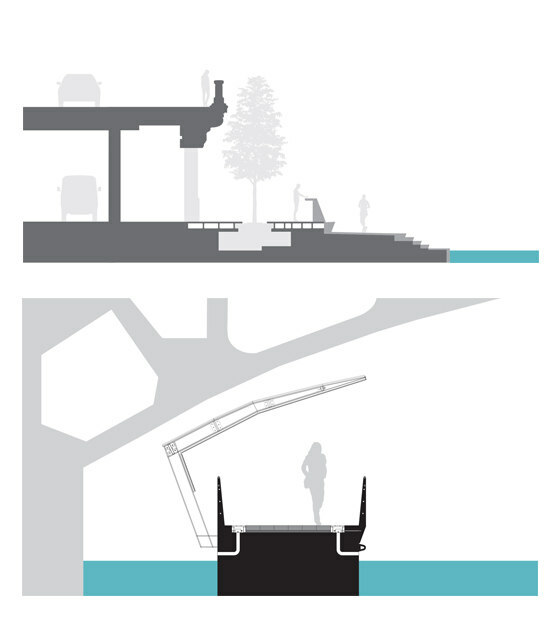 A block-wide set of steps bends the city down to the river, creating a graceful, borderless transition from street to water. 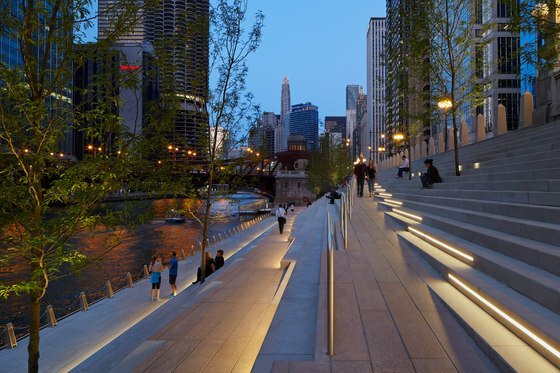 A fully accessible path is geometrically woven in, becoming a central circulation feature with seating for both staged events and watching the “theater” of the river and city. the two bodies of water. 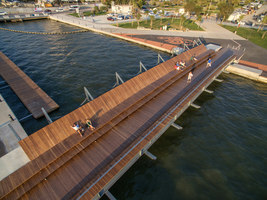 The Jetty, a series of fishing piers jutting into the River, is surrounded by floating gardens that replicate the types of plants one would see along an Illinois riverbank. Beneath are fish hotels that provide habitat and protection for the growing aquatic population. 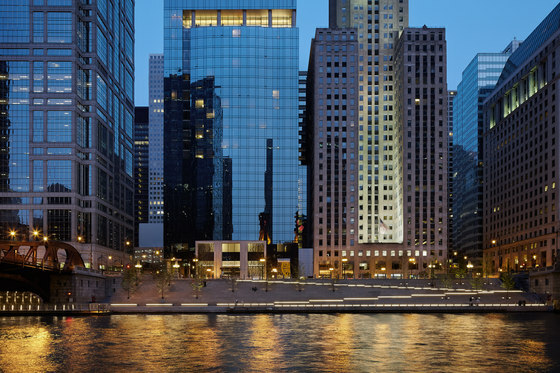 What might have been unimaginable years ago has been achieved; an activated riverfront in the heart of a booming urban core. 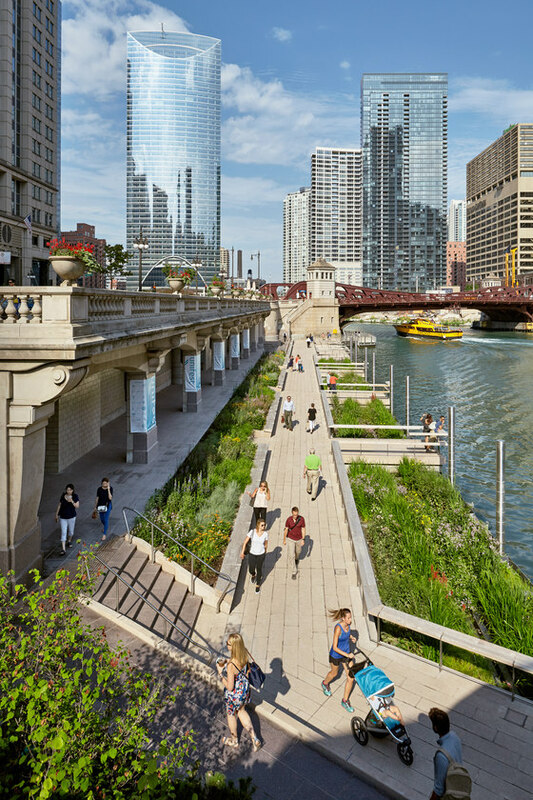 When Chicago turned its back on the river, a natural asset that was seen purely as functional became the city’s backyard. 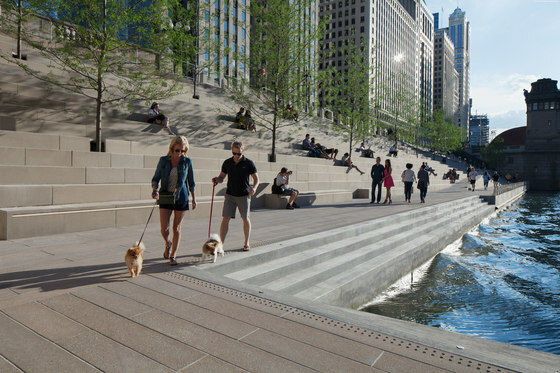 The Chicago Riverwalk has become the city’s living room; an urban counterpoint to Chicago’s front yard, Grant Park. 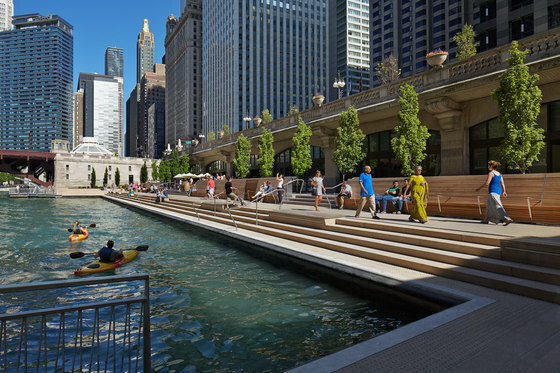 With a wine bar, kayak tours, boat docking services, water taxi stop, and a myriad of public programs, the city’s newest civic space has mobilized with unthinkable energy. 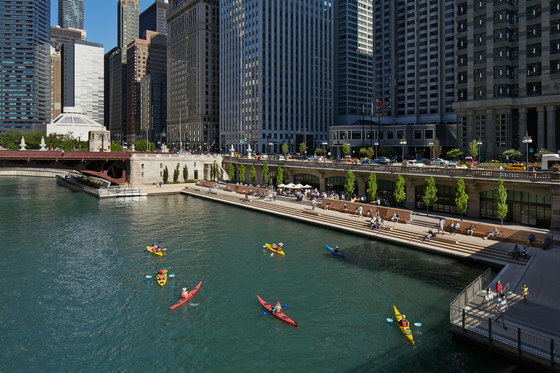 Scenes of young office workers sipping drinks and kayaks scooting along the water have become a normal occurrence.